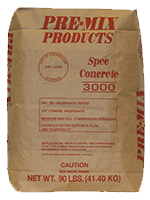 PMP Spec Concrete 3000 is a versatile dry, factory blended concrete specifically designed for the professional contractor. The standard mix is 6.5 sack, 70% sand and 30% 3/8 aggregate. It may be used as a poured-in-place conrete, or as a masonry grout depending on the amount of water used in its preparation. Approximately 1.2 gallons of water per 90 lb. bag produces a 2-in slump. A slump of 2 to 3 inches is required. Approximately 1.4 gallons of water per 90 lb. bag produces an 8-in slump. Masonry grout must have a slump of 8 to 11 inches. Excellent for multi-story and difficult access jobs.